Another time, I wrote a long rambling piece in which I referred to Barack Hussein Obama as “the African writer and President of the United States.” The editor objected and edited the title to read: “African-descended writer and President of the United States.” I was trying to make a political point with my language. The editor modified it with his biases. I could have insisted on the original language, but I did not. Here was a prestigious Western journal offering lowly me a space to show off whatever skills I had, who was I to object? I made a few noises and moved on. If I had submitted it to a Nigerian journal, more than likely it would have been published as I wrote it – for different reasons. The term “editor” is just that – a term that describes people who do not live in Nigeria. They live in the West where they take their beady little eyes to African literature and change the words until they make sense to the Western reader and make the African reader cringe with suppressed rage. We are talking about how things get lost in the translation. Much of contemporary African literature as read in books has tended to struggle with this issue. How do you preserve authenticity of prose without losing your (paying) Western audience? It is a growing problem as my reading of EC Osondu’s This House is Not For Sale and Chigozie Obioma’s The Fishermen shows. This is really not about Osondu and Obioma, they have demonstrated amply that they are awesome writers and by all appearances have had successful outings with both books. I enjoyed reading both books; however, I have great concerns about the extent to which they and many of us go to accommodate Western readers. Things get lost in the translation. There are stories. In the 21st century, there are books and there is the Internet. And housed in the Internet is social media. It is a great time to be alive, thanks to new and emerging media, the writer and the reader are united by an embarrassment of riches when it comes to storytelling. The canvas is virtually infinite and there is a new poverty of too many choices from all the offerings. It is a good thing, especially from the perspective of Africans who previously had been forced to look at their lives literally through books alone. Reading the works of today by African writers, one is struck by the power of narrative and how much it is influenced by the use or misuse of the English language to convey what was originally thought of in an African language, pidgin English or even standard English as spoken on the streets of Africa. When it comes to African literature, language is the elephant in the room, by which I mean in an unconventional sense what is gained – and lost. This should be a new way of writing that takes cognizance of the reality of our African situation. It has to take into consideration the history of the African child and the conditions of living. Africa is a continent in a crisis. We cannot accept to remain in this crisis forever. We have to act now and the literature we write has to be the literature of reconstruction. We have to fill African peoples with hope and skills to steer society to a new level. We have to help Africans reconstruct their lives and that of their society. Our literature should advocate for dialogue and critical consciousness. Theatricalities aside, the difference between Ngũgĩ and myself on the issue of indigenous or European languages for African writers is that while Ngũgĩ now believes it is either/or, I have always thought it was both. Achebe, Chinua (2009-10-05). The Education of a British-Protected Child: Essays (p. 97). Knopf Doubleday Publishing Group. Kindle Edition. Interestingly enough, in my mind, in their works, Achebe and Ngugi proved that one could take the English Language and appropriate it for oneself and write with it as if one was writing in one’s indigenous language. Read Achebe’s books, especially Things Fall Apart, Arrrow of God, No Longer at Ease and A Man of the People; the beauty of Achebe’s novels is in how he took the English Language and fooled the reader into thinking that the characters are speaking Igbo. Reading Things Fall Apart especially, the reader would be forgiven for thinking that Achebe was writing in Igbo. The man was a genius. Achebe’s approach was brilliant on many levels; economically, trying to sell a novel in the language of my ancestors would be a huge challenge. Not many people would buy it because many of my people speak the language but can neither read nor write it. Besides, there is not much of a market for works of fiction written in my language. That is the least of our challenges. Achebe and his generation of writers brilliantly sidestepped that challenge by being creative with the use of the English language. They appropriated the English language and made it uniquely their own. That is how it should be. Generations of African writers after Achebe have struggled to match his brilliance. There are economic reasons for this; the indigenous publishing house and editors that supported Achebe and Ngugi have virtually disappeared, leaving a huge vacuum that has been filled with mixed results by Western publishers and their editors. In the absence of a robust publishing industry at home and thanks to largely incurious and anti-intellectual rulers, African writers have been forced to flood the West with their manuscripts. The West deserves credit for almost single-handedly sustaining African literature with funding and an eager paying readership. However, it has come at a cost on at least one important level; many African writers eager to be published and salivating at prestigious literary platforms have largely allowed the West to distort the literary language in their books. It is almost understandable, these writers are not negotiating from a position of strength, so they watch helplessly as words and terms that make sense in African settings are jury-rigged for Western tastes by Western editors whose awesome editorial skills are hugely compromised by their cultural cluelessness. As an aside, I really believe now that Western editors need to collaborate with the few African editors out there as they prepare African literature for the print shop. The Western reader enjoys the new language of discourse but it is painful to read as an African. So much in contemporary fiction in the books published in the West has been distorted for the simple reason that there is a buying audience that needs to understand these things. It is an economic decision but the implications for Africa and the trajectory of her stories are enormous and mostly tragic. Osondu’s book is a work of fiction that educates and entertains the reader with interesting experiments in story-telling laced with historical accounts of a bygone era. I enjoyed reading the book; the stories are garnished with witty observations from the eyes of a child living in a house (called “Family House”) filled with interesting characters, characters that could only have been conjured up by a mind on steroids. I recommend it to the reader dying for good fiction. The blog Africa is a Country has a good review of it here. There are many things to like in the book – from the editing, to the meticulous research, to the disciplined, short sentences that showcase Osondu as a writer in charge of his craft. Osondu deploys an unusual but ultimately effective approach to writing this book that draws primarily on his strengths as a writer of short stories; there are all these fascinating characters. Osondu maintains a disciplined focus on the characters that live in this fascinating house called “Family House”, a not-so-mute witness to life, dishing out opinions through its many characters that live in her. As an experiment in writing out of the box of orthodoxy, Osondu pulled that off nicely. But then This House is not For Sale is written with a broad Western audience in mind; Nigerian words are italicized and carefully explained in the same or preceding sentence. African writers should perhaps learn to be more insular, who italicizes akara and explains it as “bean cake” in the 21st century? If the reader is too lazy to use Google, I say, tough luck. To be fair, after all these years of railing at African writers, I now realize that African writers who choose to publish in the West are not negotiating from a position of strength; the editor is Western, the publishing company is Western and the paying audience is Western. It makes marketing sense. However, it doesn’t make it any less maddening. Imagine if Tolstoy in War and Peace had taken the time to italicize and explain every word foreign to the African reader. That book would have been way more than 50,000 pages. In the writers’ defense, Nigeria has precious few indigenous publishing houses, what is a writer to do? You want to be published? Take the crap from the Western paymasters. Growing up in Delhi in the 1980s, I spoke Hindi and Urdu, but had to self-consciously relearn them as an adult. Many of my background didn’t bother. Keeping the reader entertained with a book in the age of the addiction called social media is an amazing feat in itself and Osondu passed that test with me. However, the reader is also facing personal challenges; social media is the new addiction that comes in short posts and grunts in tweets. Reading long form is now the new distraction. The intensity of feeling, the rush that comes with the instant feedback and contact with the reader and writer and the reader becoming a writer also (reader and writer exchanging roles). Like most novels by Africans published in the West, this book is squarely aimed at the West for the benefit of her reading audience. It is not a novel for Nigerians; it is a story about Nigeria sold to the West. The dialogue has been modified and outfitted to make sure Westerners understand what is going on; distinctively Nigerian terms are helpfully italicized and explained. Here, dodo is “fried plantains” you are told. It is a frustrating book if you are a Nigerian and you know that you are reading the work of a brilliant mind who has had to compromise heavily in order to sell his work where the paying audience is. I do not blame him. There was a time I used to blame African writers for what I saw as a compromise or a selling out but what are their choices? There is no paying audience back home. It doesn’t make it right, it is what it is. English, although the official language of Nigeria, was a formal language with which strangers and non-relatives addressed you. It had the potency of digging craters between you and your friends or relatives if one of you switched to using it. So, our parents hardly spoke English, except in moments like this, when the words were intended to pull the ground from beneath our feet. Our parents were adept at this, and so Mother succeeded. For, the words “drowned,” “everything,” “exist,” “dangerous” came out heavy, measured, charged and indicting, and lingered and tormented us long into the night. – Obioma, Chigozie (2015-04-14). The Fishermen: A Novel (p. 24). Little, Brown and Company. Kindle Edition. Our parents often found the need to explain such expressions containing concealed meanings because we sometimes took them literally, but it was the way they learned to speak; the way our language— Igbo— was structured. For although the vocabulary for literal construction for cautionary expressions such as “be careful” was available, they said “Jiri eze gi ghuo onu gi onu— Count your teeth with your tongue.” To which, once, while scolding Obembe for a wrong act, Father had burst out laughing when he saw Obembe moving his tongue over the ridge of his mouth, his cheeks furrowed, saliva drooling down his jaws as he attempted to take a census of his dentition. (pp. 39-40). “Catch ‘im,” he snapped with a bloodshot widening of his eyes and a flash of sharp teeth — “catch ‘im. Give ‘im to us.” “To you, eh?” I asked; “what would you do with them? “Eat ‘im!” he said curtly. . . .
Naibi deploys impeccable Pidgin English which she promptly italicizes and explains with standard English. I really hate that she does this. Again, I don’t like that Naibi italicizes the Pidgin English, and then helpfully translates it, presumably, to Western readers. It is what it is but I prefer this approach to the bastardization of pidgin preferred by Nigerian writers who write primarily for the West’s consumption. A lot is lost in the unnecessary translation. It is perhaps true that the paying audience is in the West and the writer is under a lot of pressure to get as wide an audience as possible, but there are unintended consequences. The writers of the West gained traction in other climes by being relentlessly insular even before the advent of Google. That insularity bred a nagging curiosity in readers. It is counter-intuitive but I suggest strongly that African writers need to find the muscle to be insular, to force Western readers to be curious enough to want to learn about African communities by getting off their duff and doing the research themselves. But then, we are not negotiating from a position of strength. They have the money and the publishing houses. This is why I love Facebook and Twitter; you can’t italicize egusi over there. At least not yet. It is not all gloom and doom. We must acknowledge however the brilliant work of an emerging army of writers and thinkers acting as leaders, who have been doing awesome work in the digital space. I am thinking of young unsung writers who have been forcing conversations about African literature and/or creating innovative platforms digitally. It bears repeating; there is a robust body of literature out there on the Internet. There we do not feel the need to italicize ugali or egusi, and provide long apologetic footnotes, Google is your friend. One of the unintended effects of forcing our stories through Western eyes has been to italicize us into the other. 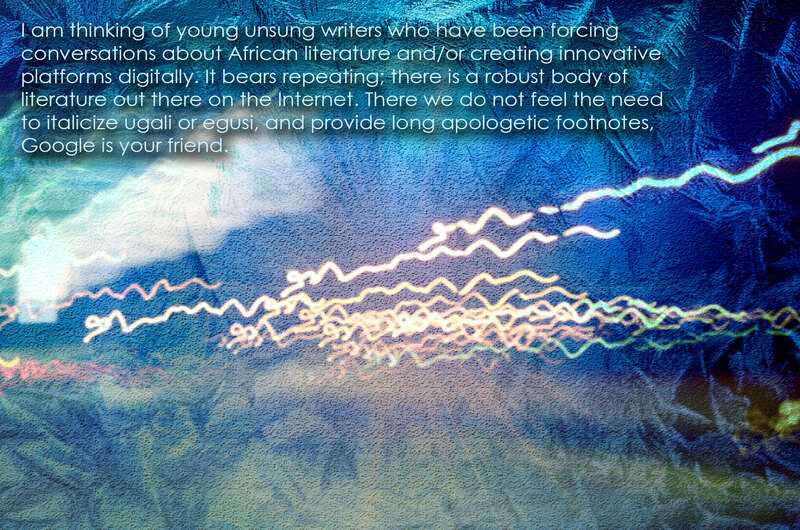 On the Internet, African writers don’t have to. And that is one reason the Internet is the book of choice for millions of African readers. If we could only find a way of making it profitable for great minds like Osondu and Obioma, we would all be happy. By the way, it would be revealing to see what is in the literature/English curriculum in classrooms in Africa from secondary to university. What and how are we teaching our young? If we were to do a survey, what authors would appear in the curriculum? What is the nature of the graduate research, is it still steeped in the Achebe/Ngugi/Soyinka mindset? What are the examples of innovation we can brag about? Let’s model what we demand of the West. It is how we speak in Lagos, isn’t it? It’s English but not English – scrambled, if you will, with a sprinkling of Pidgin. Everyone I know relapses to this Nigerian English in every other sentence. It’s how we say “I’m coming” when we are going – to mean “I’ll be right back.” It’s in the way we say “they say…” when we are gossiping. I wanted the narrative to be as informal and flow-y as possible in a “come-and-see-what-happened-to-me-yesterday” way when you’re talking to a friend. But also in an introspective way, so that the narrator is working through how she feels about things as she tells you. I agree 100 percent. Aguda gets it, but she should not look to be a star writer adored in the West anytime soon. The issue of language and its politics in literature is clearly on Obioma’s mind and he delivers a feisty defense of experimentation in this interview and in his essay, The audacity of prose. It is a brilliant essay, it does appear though that Obioma is being defensive about the poetic license he deploys in The Fishermen. It was an audacious initiative but was he successful? By all standards, he has written a good book, but from the perspective of this African reader, the audacity does not advance African literature one whit. Rather it seems to create space in a spectacular and muscular fashion for a genre that is devoted entirely to satisfying Western literary tastes. In some instances, it is at the (unintended) expense of Africans. Well, in Obioma’s defense, he did not refer to the Nigerian game of football as soccer in the book. He did not italicize it either. Taboo is taboo. We are making progress. Ikhide R. Ikheloa (@ikhide) is a blogger, social and literary critic who writes non-stop on various online media. His work has been published in several books, journals and online magazines. He offers his unsolicited opinions on literature and world affairs in various columns in the Next Newspapers and The Daily Times of Nigeria. You will find him blogging about politics and literature at http://xokigbo.wordpress.com.